CELEBRATING 20 YEARS!!... of business in the Greater Philadelphia area! In 1994, We opened on the corner of Castor and Kensington Avenues. With a simple business model. Only buy and sell cars that you would be proud to own. We have built success and reputation, simply by sourcing quality inventory. Knowing that customers will likely need help with financing, a second value came into view. Offering financing for people with good credit was easy. But, I knew we could separate ourselves, by genuinely helping people with credit difficulties make decisions on financing, based on quality information. 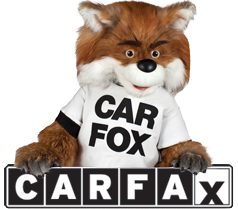 Helping customers re-establish their credit became a very important part of our success. These two core values created an atmosphere that lead to many long term happy customers. Fast Forward 20 years.... and we have never needed to change from our original program, at all. This format has created life long customers, and a growing base of new ones. All based on good business. 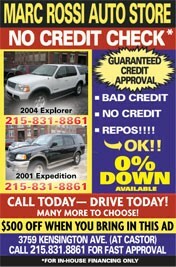 In doing this we became the biggest volume, longest running Credit Acceptance Dealer in Pennsylvania. 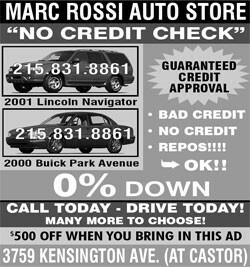 We've Been Running This Ad In The Daily News For More Then 10 Years!